Prepare rice using any method you want. 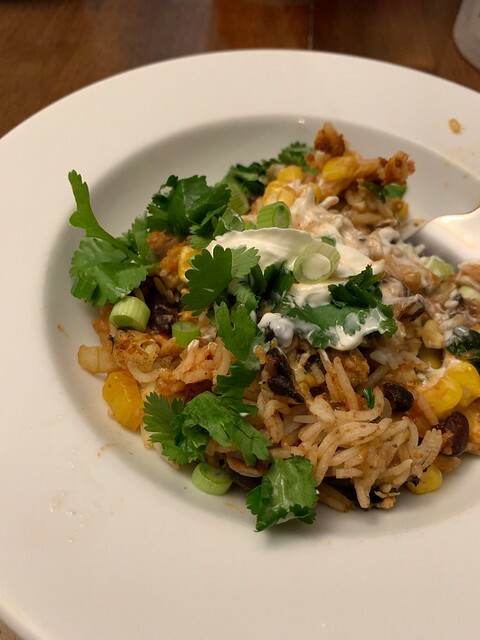 I used the instant pot method from A Couple Cooks. In a large skillet (I used a dutch oven), melt a tablespoon of butter over medium-high heat. Add the bell peppers, onion and garlic to the pan and sauté until tender. Add in chili powder (approx. 1 ½ tablespoons), paprika and cumin (approx. ¾ tablespoon of each), or taco seasoning to taste. Stir to combine. Add the cans of beans and stir to combine. Remove from heat and add cooked rice. Stir to mix well. Mix in the frozen corn. In a skillet, brown the ground turkey (mine needed a bit of olive oil in the pan) Mix with chili powder (approx. 1 ½ tablespoons), paprika and cumin (approx. ¾ tablespoon of each) and salt to taste, as well as 2 oz. of water. At this stage I added a bag of fresh spinach I chopped up, just because I had it leftover, and tossed til it was wilted. To assemble the lasagna, pour half of the jar of salsa in an even layer over the bottom of a casserole dish. Layer evenly with flour tortillas to cover. Spread approximately half of the rice mixture evenly over the tortillas. Sprinkle with a layer of shredded cheese. Add another layer of flour tortillas. Pour a layer of enchilada sauce over the tortillas. Spread turkey/spinach mixture evenly over the enchilada sauce. Top with the remaining rice mixture in an even layer. Spread the remaining salsa evenly over the rice, and sprinkle with a layer of shredded cheese to finish. Bake at 375° for 25-35 minutes, or until the cheese has melted and begins to brown a bit. Allow to sit 10 minutes before serving. Top individual servings with sour cream and fresh cilantro, for garnish. Servings: The amount above made one 8×8 pan (fed us for one dinner, and I think I’ll get 2 lunches out of the leftovers), and then one pan that’s about 13×9 that I froze prior to the baking step. Kids: Seemed to like it okay but no one was raving about it. Notes: As I was reading very, very old posts on my blog, I was reminded of this dish and wanted to try changing it up substantially. This version ended up slightly dry but I think that’s because my rice sat out a for a bit before I mixed it in with the beans/veggies. I think I’d go back to salsa verde if I made this again and also add a bit more of a it and also more enchilada sauce. The change to ground turkey and the addition of the spinach were great. 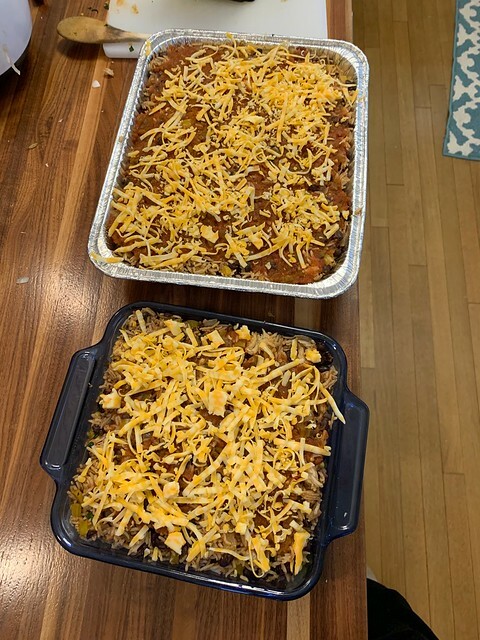 Apparently we’ve made several versions of mexican lasagna and none have stuck as a favorite – maybe we should just stick to classic enchiladas?? 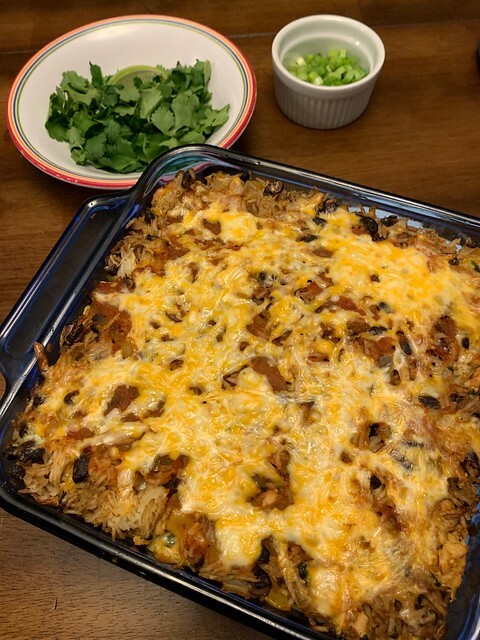 This entry was posted in black beans, cheese, cilantro, green onions, onion, red pepper, rice, salsa, spinach, turkey. Bookmark the permalink.